A Heritage Council funded conservation study is the first step in securing the future of the historic Elsinore House at Rosses Point. 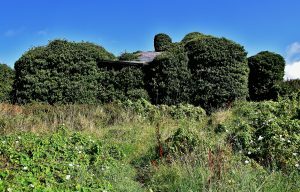 OBSCURED: Elsinore House now has become overgrown and almost totally obscured by ivy. Hidden behind a wall of ivy for over a decade, the future of Elsinore house at Rosses Point is suddenly much brighter with the awarding of a grant for the funding of a conservation report on the structure of this house, which the poet WB Yeats visited frequently in his youth and which featured in the painting of his brother, Jack Yeats. Having only recently reacquired possession of the property, the timing was right for the descendents of William Middleton (1819-1882) when approached by representatives of An Taisce’s North West Local Association with the offer to work together to safeguard the ‘At Risk’ structure. Built in the early 19th century and home to shipowner and alleged smuggler John Black, Elsinore later came into the ownership of William Middleton a senior partner in the highly successful 19th century firm of Middleton and Pollexfen which operated mills and traded far and wide with a fleet of barques and schooners. William’s sister Elizabeth was grandmother to WB and Jack Yeats who, like their Middleton relatives, enjoyed many summers spent at Elsinore. By the start of the 20th century, William Middleton’s offspring were still living at Elsinore during the summer months, however the history of the house in later years was marked by a succession of tenants and neglect that led to it falling into a ruinous state. The 150th anniversary of the birth of Yeats in 2015 prompted renewed concern about the state of the property. This led to the Middleton Estate, comprised of William’s descendants, partnering with An Taisce North West in successfully applying for a Heritage Council grant that has enabled the commissioning of a conservation report on Elsinore house and its outbuildings. It is hoped that this report will provide the basis for future interventions to safeguard and enhance this historic structure.